I bring my Weekly Canvas, which contains my goals for the week. 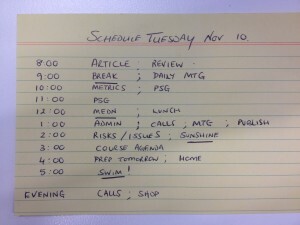 I want to ensure that my daily activities align with longer term goals. Firstly, I write down the single biggest win that – if everything went pear-shaped and I achieved only that – I would be happy. This is not necessarily the most urgent thing. It’s the most important to me. It might be something I have procrastinated about or I just need to start but not necessarily finish. A big win builds momentum and motivation, making me more productive. Think: What three steps must I take to progress? It is so important to think now to allow focus on execution later. This reduces mental effort and avoids procrastination when my brain is less fresh later. Timebox: I give each a deadline by which I must complete. This focusses my mind to ensure the day doesn’t get away. Recover: I decide how I will celebrate or rest after each win, e.g. a walk, meditation, coffee, sunshine etc. I make it easy for myself. Each activity is either thinking or non-thinking. Non-thinking I do at my desk preferably after lunch and I denote with PC. Thinking tasks I denote with T and generally do in a quiet space outside. I always seek the opportunity to take work outside. This keeps me fresh. Days where I spend time outside are much more satisfying. Four By For – four goals, by a certain time, for a simple reward or rest activity. 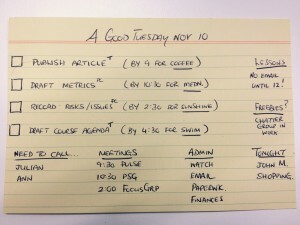 Four goals each day might seem small compared with a typical long to do list. There are good reasons for this. 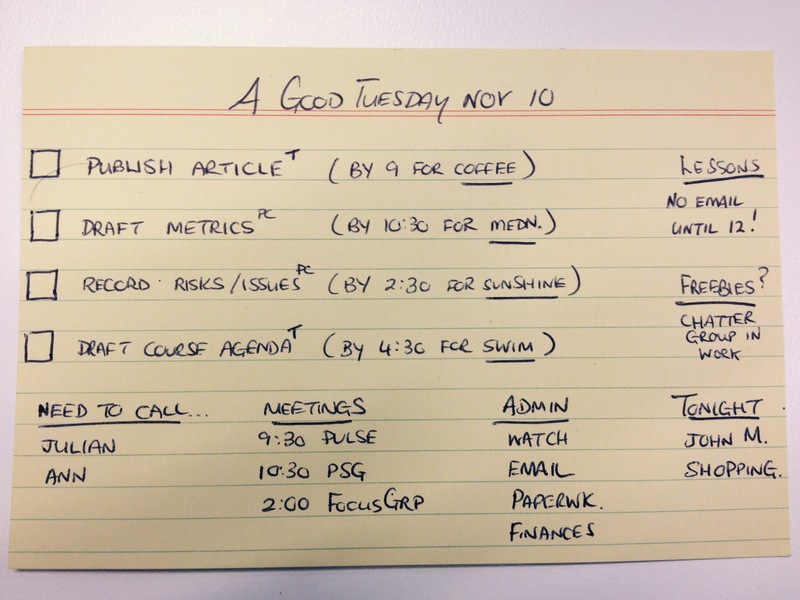 I can generally kick 2-3 big goals each morning and 1-2 in the afternoon, accounting for overhead such as emails, calls and meetings. This might be different for you. I will write shortly about the science behind why four bursts a day is an optimal way to work – TBD. Help: I note down anyone I need to contact today to get help, make decisions or move my goals forward. This can be face-to-face, calls or – as a last resort – email. I generally do this walking between tasks or after lunch. Learn: I consider any lessons from yesterday’s Daily Card and write down how I will gain time today. Today I will keep email closed until 12pm. Cheat? I try to identify where I might get a quick win or gain something with minimal effort. I call these freebees. Meetings: Some meetings contribute to my goals or help others achieve theirs. Some are overhead I try to minimise. I try to keep meetings to the post-lunch fade because morning is my most creative time. Admin: This is any emails, housekeeping, quick tasks or any requests I need to send. I bundle and do them standing up at my desk after lunch. Tonight: Anything I need to leave until I am home. I try to avoid this as I like to switch off in the evening. 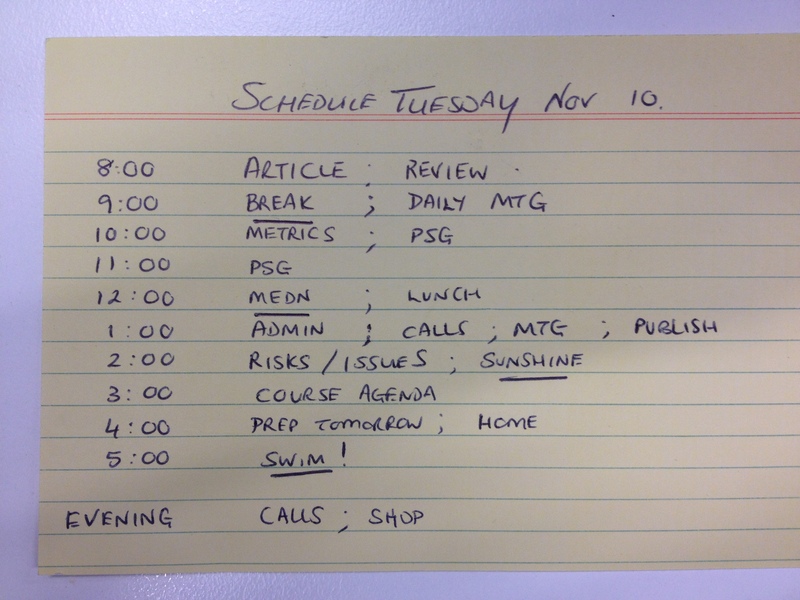 Finally, I schedule all activities from the card into each hourly timeslot as shown below. Prevent my day being derailed. As I schedule, I see what is possible ahead of time and adjust. This avoids disappointment at the day’s end. My typical day after planning goes like this. I do not open email until lunchtime. I spend the first two hours achieving 1 or 2 big wins. I take a break. I then get another win before meditation and lunch. After I Lunch my way to Wellbeing, I go to stand-up mode. I open email for the first time and do all of my admin, sending any requests I need to. I then close email immediately. I move onto my next one or two big wins. Finally I review the day to complete any last-minute items I absolutely must get done. I quickly preview tomorrow and process email for the last time before I leave. I avoid checking emails, instead processing them to get to an empty inbox. This includes extracting anything so I can avoid email tomorrow morning. If you’ve read My Top 10 Commitments for Stress-free Productivity, I’m sure you have that red notebook on your bed for gratitude! I am now adding today’s achievements, what worked and why. This helps me to celebrate and to gradually improve how I plan as my brain brings these into the next day’s planning. I’ve added a few things to my Daily Card that work for me. I call it “A Good Day” rather than “Daily Plan”. This helps me start positively because I picture the satisfaction I will feel at the end of this day. It has a “Will do” list rather than a “To Do” list. It just feels like I am setting the priorities and have control rather than having something forced upon me. I use check boxes so I can tick things off. This builds momentum, creates flow and really encourages me by celebrating the little wins during the day. I get my dopamine rush and a reward – which I am about to take now after publishing this! Have a great week and if you have any comments please feel free to contact me.